Square Enix titles broke the record of its historic low price once again! However, we'll only talk about the Final Fantasy titles in this post. Whatever, these discounts will end from March 29, so grab time to put these games to your cart with the Steam keys or Mog Station keys. 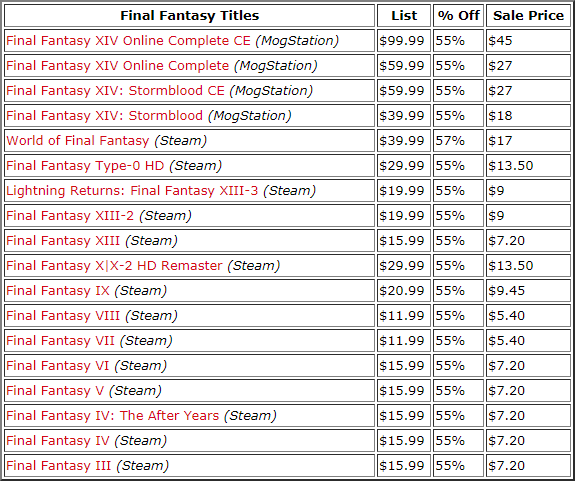 Most of the Final Fantasy titles listed below are at new historic low prices, given previous discounts have always been just 50% off (they are now 55% off at GreenManGaming). A big update for Final Fantasy players! This is quite exciting! The new content will be available within a few days, so just seize the limited time and gather enough money and necessary gears and players ahead. If you need gils in game, you can buy cheap FFXIV Gil on FFXIV4GIL.